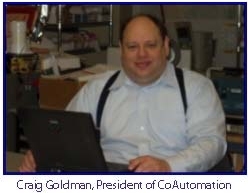 CoAutomation was founded in 1999 by Craig Goldman, a graduate of MIT’s Deparment of Electrical Engineering and Computer Science. Craig Goldman is a recognized innovator and inventor who holds ten U.S. patents and has made essential contributions to dozens of commercially successful products. CoAutomation develops microcontroller-based firmware from customer specification for research, consumer, medical and industrial products. Projects completed in the recent past include water meters, medical monitoring, industrial temperature control, small motor tester, lottery ticket dispenser, municipal water pipe leak detector. CoAutomation also has completed firmware for an IEC61508 functional safety factory sensor and controller. CoAutomation products are “well-behaved”. Craig Goldman works with the client to define product behavior early in the design process and then create detailed specifications of product functionality. Microcontroller code is developed using proprietary programming techniques to create virtually bug-free firmware. The result is a full-function product with no unexpected glitches or hiccups. In 1984 Craig Goldman created the graphics controller for a 17 1/4-inch by 11-inch CRT display. Showing 1728 by 1100 8-bit pixels, it was at the time of its introduction the highest resolution commercially available grey-scale display. In 1986, Craig Goldman was a key member of the team that revolutionized the electronics for printing pictures on laser printers; the technology was sold to Canon Inc. and it is still used today in laser printers and copiers. Craig Goldman was one of the first designers to use Ethernet to communicate between industrial controllers (1992). Craig Goldman was a member of the first team to demonstrate using the internet for factory data acquisition (1993) and the world-wide web for communications with industrial controllers (1996). Craig Goldman was a co-inventor of a unique technique to accurately synchronize device clocks using a low-power radio protocol. (2017). Craig Goldman / CoAutomation is proud to be a Senior Member of the IEEE and an active member of both the Boston and Worcester Massachusetts Sections of the IEEE Consultants’ Network. Craig Goldman’s numerous patents demonstrate his distinguished history of engineering innovation and expertise. 6,973,353 Programmable Controller for Controlling an Output State,(2005). 5,982,362 Video interface architecture for programmable industrial control systems, (1999). 5,975,737 Distributed interface architecture for programmable industrial control systems, (1999). 5,805,442 Distributed interface architecture for programmable industrial control systems, (1998). 4,800,442 Apparatus for generating an image from a digital video signal, (1989). 4,566,000 Image display apparatus and method having virtual cursor, (1986). NOTE: (Click patent number to browse U.S. Patent and Trademark Office online version of that patent. Patent will open is a separate browser window).